Occasionally you might spot a pair together, especially in the spring during mating season. This fall I’ve witnessed a number of them chasing each other around lake areas, eventually separating and going their own way. The Great Blue Heron is such an interesting bird to watch, photograph, and paint. It is a sneaky predator and has a stealth-like manner in how it stalks its prey. It glides with grace traveling long distances with relative ease due to its huge wingspan. Takes-offs and landings can be somewhat awkward due to their long, stick-like legs and s-curved neck in flight. Herons will also stand still for long periods of time waiting patiently for fish to swim by, or will rest on one leg for hours. No matter how they are posed, I always find them fascinating to watch and photograph. It’s always hard for me to choose how I want to portray them in my next Blue painting. Having just completed a close-up portrait of one, entitled The Great One, I thought it would be interesting to look back over my Great Blue Heron paintings, compare them, and write a little bit about each bird. I’ll start with The Great One. This bird was striking. In one of my photographs I called him The Warrior because his feathers were a little fluffed up from a shake and it looked like he had a coat of armor on. He was a bird you wouldn’t want to mess with. ☺ He was alone, as I watched him groom himself to perfection. He rested-up on one leg for a while and, as if a switch was flicked, turned hunter off in pursuit of his prey. I stumbled upon another solitary Blue on my birthday, January 10th. I was getting skunked on my morning bird outing. I looked up to the sky and kindly said, “It’s my birthday”. I looked down and in front of me and there he was, the Two Rivers Heron, standing in ice-cold water up to his knobby knees. He blended in with the grays, browns, and lavenders of the water surrounding him. I left him where I found him after spending at least a half hour photographing him. He was in no hurry and was appearing to enjoy his lazy, cold, Sunday morning. 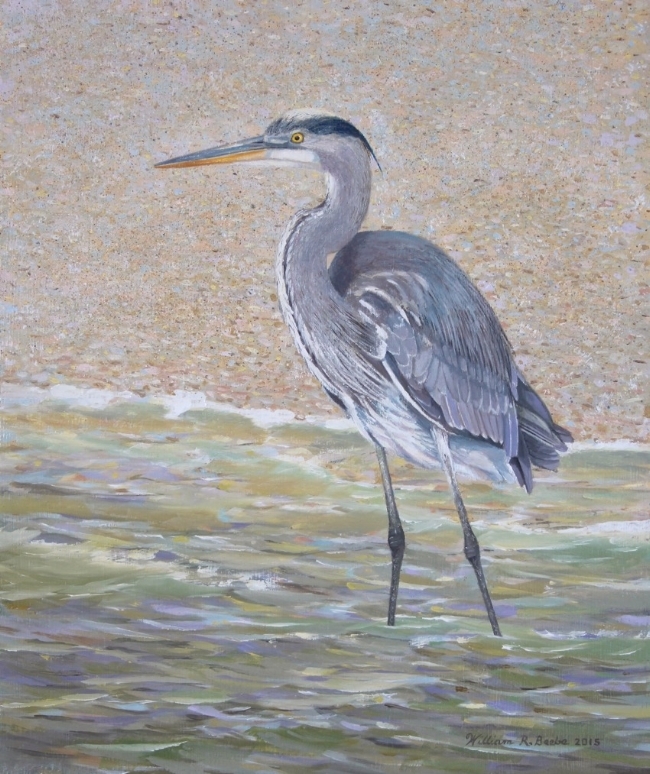 This next heron, entitled Beach Blue, was standing in the warm, clear waters of Sanibel, Florida. It was living the good life with plenty of fish to nibble on. A fisherman was nearby and he kept looking for the fisherman to toss him the small ones. Island living! In The Dance, two Great Blue Herons are depicted performing a springtime mating ritual, dancing around each other with their heads pointed skyward. It was the first time I had seen two herons together enjoying each other’s company. It was as if the entire dance was choreographed. Unlike The Dance, this next painting captures the heron in a somewhat awkward moment, Taking Flight. Some birds are more skittish than others. A movement or noise can cause the bird to suddenly take flight. This particular bird loved to hang out on this fallen tree. The tree provided a nice vantage point looking out over the marsh below. If it wasn’t for seeing this next Blue flying in overhead and landing on the tree, I might never have spotted him among the Spanish Moss. I think the Lowcountry Heron thought he was undetectable, camouflaged by the hanging moss similar in color and shape. He found a sunny spot to take in the late day sun. What Blues don’t realize is that even though they blend into their surroundings nicely, their white face in the light always gives them away. Lastly, this heron flew by low and slow. Prehistoric looking, huge in size and was on a mission. There was a fog over the lake but the bird stayed below radar, wings almost touching the surface. 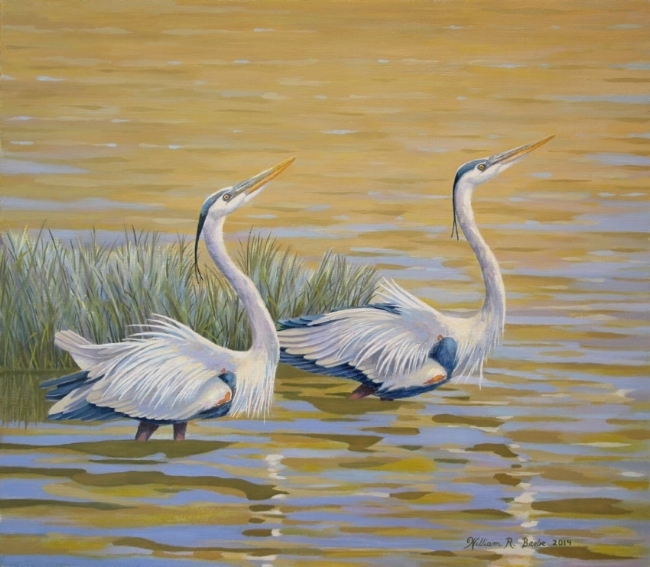 The painting is entitled Blue Morning and captures an early morning serene moment where the only noise around was the swooshing sound of the heron’s wings cutting through the moisture-laden air. Painting the Great Blue Heron is something I hope to do many more times. I hope those of you who love the Great Blue Heron enjoyed seeing my compilation of work over the last few years and reading about each bird. I never get the Blues when I’m painting a Blue! Quite on the contrary. It puts me in my happy place. Thank you as always for reading my journal and for following my art. I would love to hear from you if you would like to comment below. Thank you!